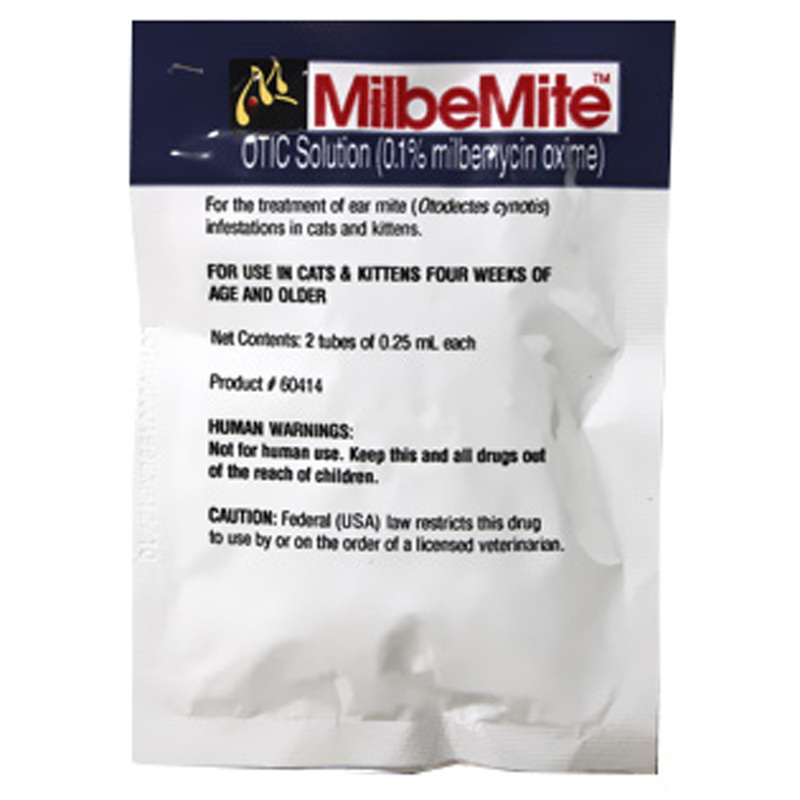 MilbeMite is used in the ear to treat ear mite infestations. For: Cats over 4 weeks of age. MilbeMite Otic solution contains 0.1% milbemycin oxime. Milbemycin oxime, when applied to the ear, kills ear mites (Otodectes cynotis). A fast, safe, clean way to treat ear mites, this ear solution kills 99% to 100% of the mites throughout their 7 to 30 day life cycle. Non-oily solution is an effective, convenient, and non-messy way to treat ear mites in cats and kittens. Comes in two tubes, for a single treatment to both ears. How it works: MilbeMite contains milbemycin oxime, which acts by disrupting nerve transmission within the parasite leading to death of the parasite. Dosage & Administration: MilbeMite is applied into the ear. Apply the prescribed amount in the ear and gently massage the ear to distribute the medication. Although the usual dose is one tube per ear, always follow the dosage instructions provided by your veterinarian. If you have difficulty applying the medication, contact your veterinarian. Cleaning of the ear prior to use of the medication can be performed, as advised by your veterinarian. Possible side effects of MilbeMite: Side effects are very rare. Lethargy has been reported. Contact your veterinarian if you notice any unusual signs in your pet after giving this medication. If your pet experiences an allergic reaction to the medication, signs may include facial swelling, hives, scratching, sudden onset of diarrhea, vomiting, shock, seizures, pale gums, cold limbs, or coma. If you observe any of these signs, contact your veterinarian immediately. If you miss giving a dose: In many cases, only one dose per ear is needed. However, if your veterinarian prescribes multiple doses and you miss a dose, apply it as soon as you remember. If it is almost time for the next dose, skip the one you missed and go back to the regular schedule. Do not give two doses at once. If you overdose the pet: If you know or suspect your pet has ingested the medication, or has received an overdose, or is showing any unusual signs, symptoms, or behaviors, contact your veterinarian immediately. What should I avoid while giving MilbeMite to my pet: Consult your veterinarian before using MilbeMite ear products with any other medications. Who should not take it? Do not use in animals hypersensitive (allergic) to milbemycin oxime. Avoid contact with the eyes. Prevent ingestion of the medication. It should not be used in animals with a perforated eardrum. The safety of the medication in pregnant and lactating animals (female animals nursing their young) has not been determined.